Auric Blends Majik Perfume Oil is a deep and earthy scent with a touch of sweetness. Myrrh adds a rich sweetness and amber brings a touch of spice. Auric Blends classic line of oil based roll on perfumes is created with a combination of exotic, imported perfume ingredients from around the globe, each of Auric Blends hand-blended perfumes are a journey within themselves. With an oil collection that ranges from floral and fruit to oriental and fresh fragrances, you're certain to find one, or maybe more, favorites! 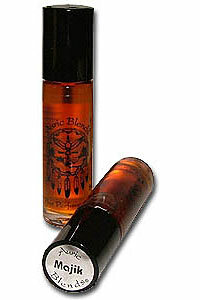 Auric Blends Roll On Perfume Oil 1/3 ounce bottle.